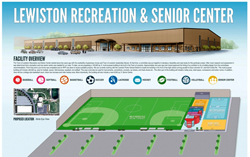 Will the proposed Lewiston Recreation Center wind up costing a lot more than anticipated? Two years ago, spearheaded by Town of Lewiston Supervisor Steve Reiter, plans began to take shape for the Town of Lewiston to develop a new recreation and senior center to be located on the Lewiston-Porter school campus. “The recreational and senior center will improve the quality of life for residents and attract people from around the region,” said Reiter, justifying his large-scale plans. The proposed 90,000-square-foot center is designed to be a multi-purpose building and ground, which could be used for football, baseball, conventions, concerts, trade shows, etc. Part of the building will include retail space, concessions, locker rooms and a 6,000 sq. ft. senior center. But Democratic candidate for supervisor, Dennis Brochey, while supporting the general concept of the plan, says he has serious concerns about the true costs and who will pay for it. While the project has been widely reported as being paid for with Greenway Funds (money from part of a settlement with various municipalities and school districts in Western NY and the NY Power Authority), Brochey says the maintenance and operating costs will be a burden to taxpayers, something that, to date, has barely been discussed. He wants a careful study made. The language of the proposition asks for the approval of a maximum of $8 million in serial bonds for the project. "Every penny over the amount covered with Greenway money, is the town's obligation," Brochey says. “That has to come from existing town spending or other revenue. People need to know that." Town of Lewiston voters will decide if they want to proceed with the project in a referendum set for July 15th. A "no" vote will not necessarily end the large town proposition, but slow it down until the true costs are evaluated.